When Are Guests Most Likely To Convert On Your Website? 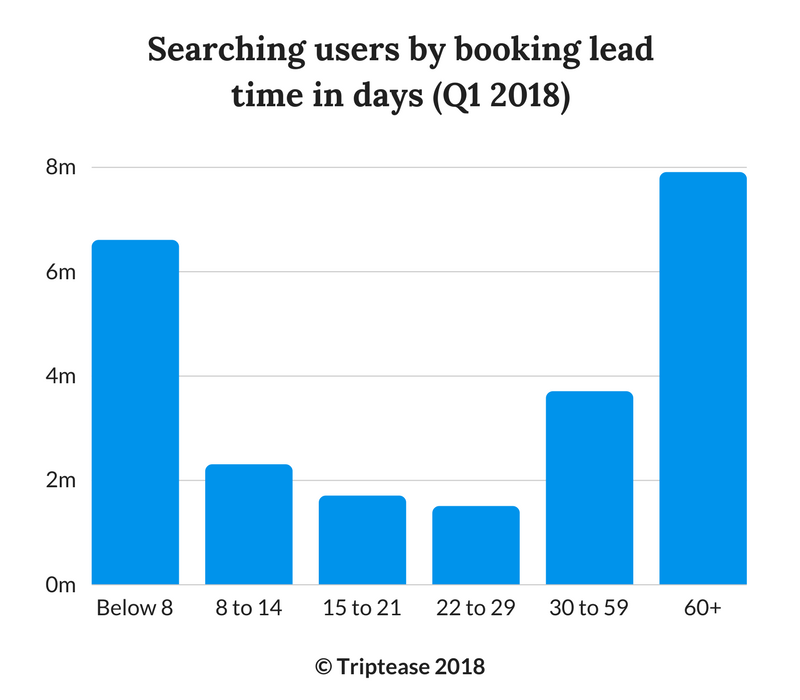 Searches made more than 60 days in advance of check-in date have the highest Average Booking Value (ABV) - and the lowest user conversion rate. That's what we've learned from analyzing the behavior of over 28 million users on our partner hotels' websites in the first three months of 2018. We found that bookings with a lead time of over 60 days had an average value of $1007, in comparison to an ABV of $585 when the lead time was lower than 60 days. The user conversion rate, however, was an average of 3.4% for a 60+ day lead time - compared to an average of 4.7% for sub-60 day lead times. This largely ties with what many hoteliers already assume about their guest behavior. We would assume that those planning longer (and therefore more expensive) trips would begin searching for their rooms earlier than, say, someone booking a quick overnight stay. It's also understandable that the user conversion rate tails off as lead time gets longer; someone booking over two months in advance does not have the same urgency driving their buying behavior as someone booking their hotel less than a week out from their check-in date. 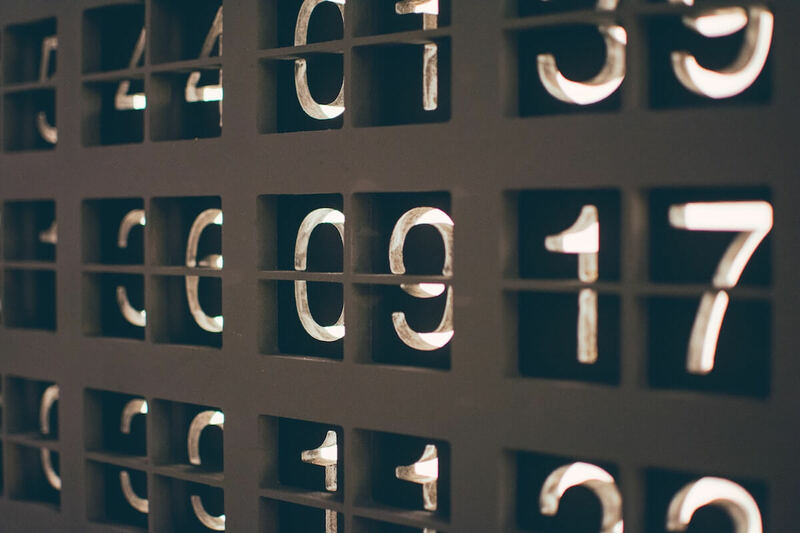 Note that 'user conversion rate' in this data set is calculated on users who have already made searches, so will be higher than the conversion rate for an average user. Over 7.8 million people made searches more than 60 days in advance of their check-in time in the first three months of 2018. The bookings made with the same lead time accounted for 40% of the Total Booking Value (TBV) of the same period. 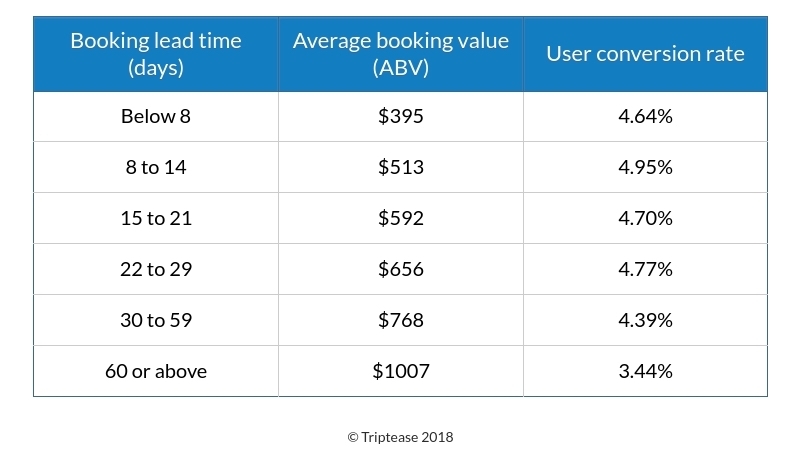 Additionally, while bookings made less than a week out from check-in date had the lowest ABV of any bracket ($395), they accounted for the second-highest number of people searching and the second-highest percentage of TBV (19%). 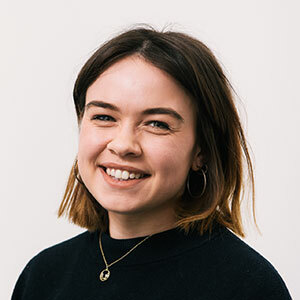 Both early-bird and last-minute bookings, then, should perhaps be areas of tactical focus for hoteliers looking to take advantage of existing user behavior (rather than attempt to persuade users to drastically change how they book).